Descent has always held a fascination for me. Not a great one; not enough for me to seriously consider buying a copy. But the idea of an ongoing campaign in a board game, where your characters level up and persist from game to game – that’s where it interests me. A campaign like that brings me right up to the dank doorway to the underworld. Here I stand, wondering what’s inside that dungeon, peering into the gloom, wishing I’d brought a torch. From inside, I can hear the sounds of so many other adventurers, happily having their limbs hacked off by otherworldly nightmares, falling into doom-y pits, and then spending all of their rewards in local taverns, desperately trying to drink away the awful trauma of it all from week after week. How jealous I am of their exploits and stories. It is the idea of a campaign that has me so excited for Pandemic: Legacy, and that made Necromunda my favourite Games Workshop game, back when I was a wee wargamer. So a campaign board game in the Star Wars universe, with characters levelling up, gearing up, improving with every game, the threat around them increasing all the time, the grip of the Empire tightening… I think that tips the scales for me. I think this is what it will take for me to step across the threshold and finally begin my Descent, albeit to the Star Wars theme, and with my hand gripped around a blaster of frying as opposed to a sword of slicing. On a final note, we do take a dig at traditional female ‘outfits’ in fantasy RPGs (rightfully so, I think), but in fairness to Fantasy Flight Games, at least 2 of the 6 main characters in Imperial Assault appear to be female, and more importantly, none appear to be unreasonably dressed. I don’t know the exact breakdown of all six characters, only piecing things together from various demoes and online images, but 2 of those 6 is at least a good start. Well, aside from being our 20th comic (hooray! ), this week’s one was heaps of fun to work on! 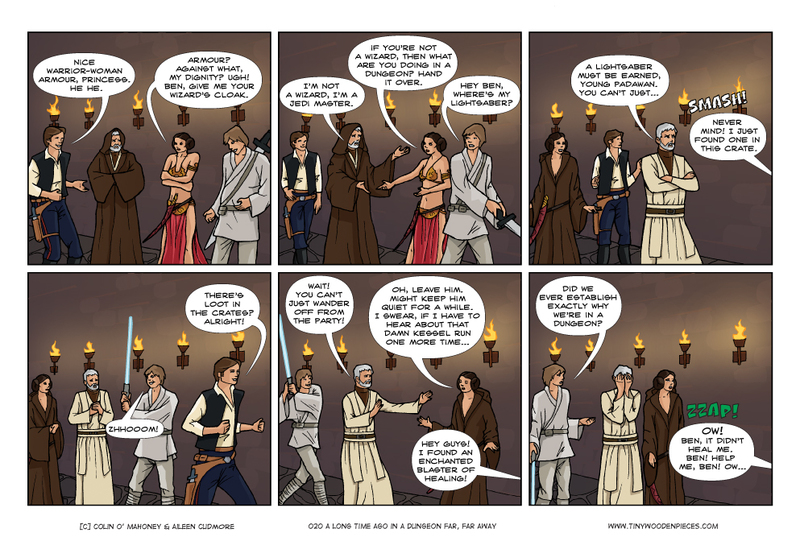 But I must say did feel really sorry for Leia in the first panel. Stuck wearing that bikini in front of a respectable elderly man and her brother, as well as having to put up with the unending joking of Han Solo. The mortification! No wonder she’s a little bit tetchy. At least she gets Ben’s robe – I’d like to think she’s much happier with that. Why there’s tentacle crawling up Leia’s robes?